Spicy Parmesan Shrimp Pasta - So flavorful, so spicy and so easy to put together, perfect for those busy weeknights! 1. 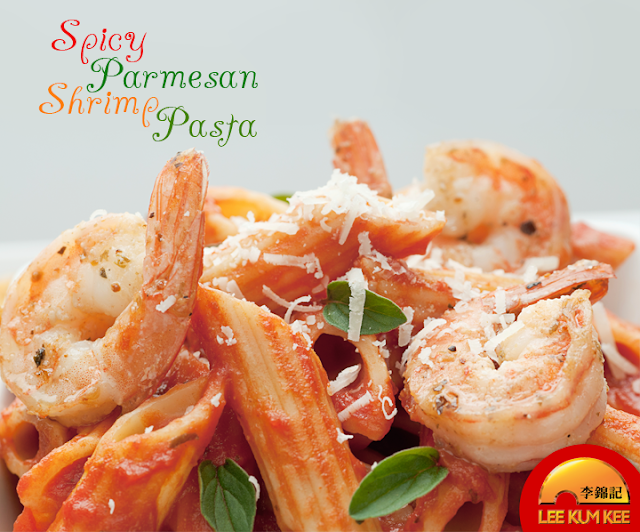 In a medium bowl, whisk together olive oil, parmesan, garlic, brown sugar, Lee Kum Kee Soy Sauce and red pepper flakes. In large bowl, combine shrimp and olive oil mixture; marinate for at least 30 minutes to overnight. 2. In a large pot of boiling salted water, cook pasta according to package instructions; drain well. 3. Heat a large skillet over medium high heat. Add shrimp and sauce mixture then cook, stirring occasionally, until pink, about 2 minutes. Stir in pasta and gently toss to combine; season with salt and pepper, to taste. 4. Serve immediately, garnished with parmesan and green onions, if desired.